The bottom line is that getting a degree matters, but what you take matters more. This book analyzes 171 majors in 15 categories. It tracks earnings by majors and provides key break outs on questions of race/ethnicity and the gender differences in earnings. On average, bachelor?s degrees pay off. But a new study confirms that some undergraduate majors pay off a lot more than others. In fact, the difference in earnings potential between one major and another can be more than 300 percent. Using United States Census data available for the first time, the Georgetown University Center on Education and the Workforce is helping Americans connect the dots between college majors and career earnings. In the new report, What�s it Worth? 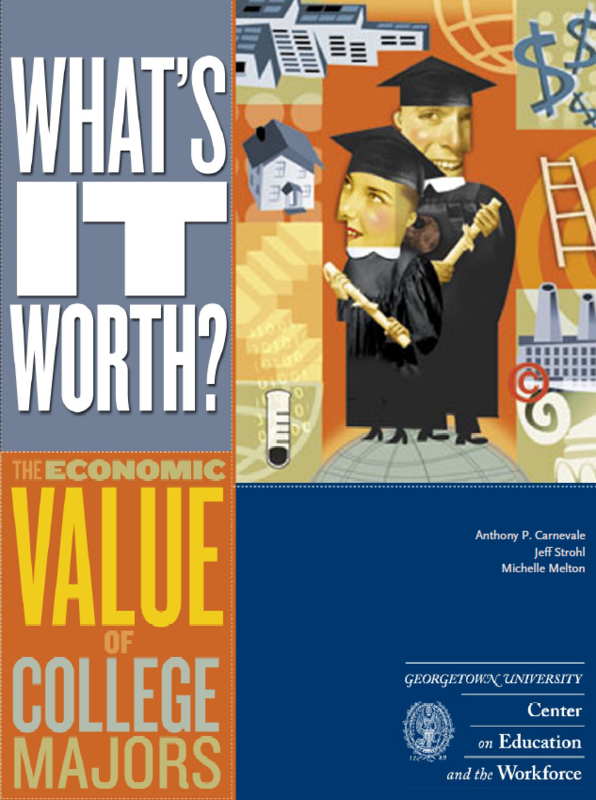 The Economic Value of College Majors, this first-time research demonstrates just how critical the choice of major is to a student?s median earnings. While there is a lot of variation in earnings over a lifetime, the authors find that all undergraduate majors are �worth it,? even taking into account the cost of college and lost earnings. However, the lifetime advantage ranges from $1,090,000 for Engineering majors to $241,000 for Education majors. The report finds that majors are highly segregated by race/ethnicity and gender, with few exceptions. White men are concentrated in the highest-earning majors, while women tend to be concentrated in the lowest-earning majors.